Celebrating over a decade of Ibiza’s dance music scene, Defected In The House Ibiza 2013 is the latest in Defected’s compilation series. Spread over three CDs, it takes in tracks and remixes from Loco Dice, Rachel Row, Steve Bug, Nick Curly, Guti, FCL, Kings of Tomorrow and David August. Defected’s Ibiza edition of their In The House series once again defines the season, representing a true reflection of the musical direction of the White Isle. On the new mix, Defected founder Simon Dunmore has selected records that represent both the house heritage for which Defected is known and respected, as well as further developing their reputation for introducing and nurturing exciting new talent. “We are still a soul based record label although the soundbed for the songs we release changes as the house sound evolves,” says Dunmore of his approach to this new undertaking. “There has been a reaction by some people to move away from the commercial dance scene and I think we have benefitted from that. 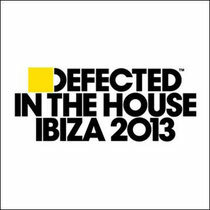 Defected In The House Ibiza 2013 is the first release to boast new artwork as part of a complete brand overhaul of the label. Conceptualised by world-renowned designer, DJ and producer Trevor Jackson, the rebrand includes a new logo, artwork direction and website, further details of which will be released over the coming weeks. It’s out May 19.